Strap in. It’s brutal across the board. 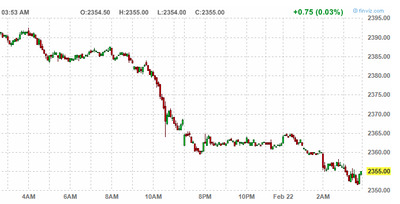 US futures are at their lows of the morning, thanks to grim market conditions all around the world. The Shanghai composite fell 2.6%. Japan fell 1.8% after another warning about its sovereign debt. Korea, which is facing threats of a bank run, fell 1.7%. Europe is in similarly bad shape. The euro is getting hammered. The IBEX is down 1.7%. France’s CAC-40 is down over 1%. On the commodity front, even gold and silver have reversed a bit, corresponding with a hard flight-to-safety spike in the dollar.